Free Class for Beginners! Find out what classes at the Academy are all about! Beginning students find out what it’s like to take a class with Sheryl Williams at the Academy of Alcohol Ink. When you sign up for the Mailing List, you will receive a coupon to reduce your class price to FREE. Be sure to check your spam folder if you do not receive your email. If you already subscribe to the mailing list, your information will be updated and you will receive your coupon in an email. Here’s a video to show you the process to get your free class. 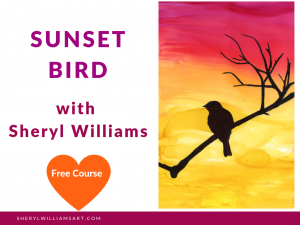 How to get your free Beginning Alcohol Ink class. from Sheryl Williams on Vimeo.